Yaqin MS-110B is a power amplifier built on the basis of new generation KT88-98 lamps that works in a push-pull system generating 2x50W power at 6ohm. The device has been equipped with dedicated Audio transformers (made in Japan), from silicon steel (core sheet 0.35mm thick) and anaerobic copper wire that has been wind and divided into 15 layers. This provided a wide frequency response, so that both low and high tones sound extremely well, clearly and powerfully. The amplifier plays very dynamically, with a beautiful deep bass and a very good extension at the other end of the frequency. The game is very wide and deep. The resolution is quickly noticeable, mainly in medium and high tones. Nothing fades, details do not die under the flow of other sounds. 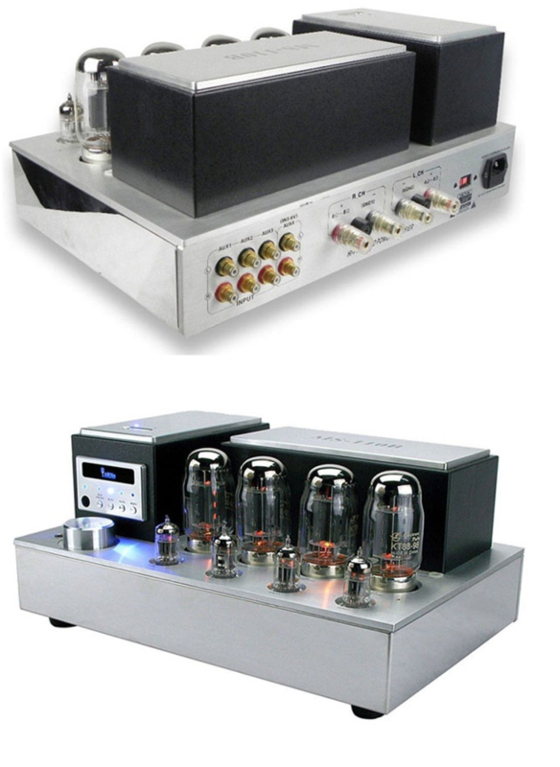 The amplifier is equipped with a protective cage for tubes and a remote control. The use of high quality components is a guarantee of exemplary reliability.